The Calgary housing market got off to a good start in 2013, with residential real estate sales increasing by 15 percent when compared to the same time last year. According to the most recent CREB report, January housing sales were up to 1,230 in January 2013 compared to just 1,068 last year. Nonetheless, sales remain significantly lower than they were during the peak years of 2003 through 2008. Calgary's single-family housing market was strong this January when compared to the same time last year. 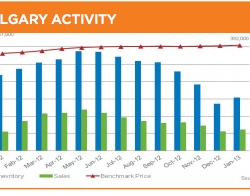 With 879 units sold, January 2013 showed a 15 percent increase over January 2012. New listings, on the other hand, were only slightly above their January 2012 levels with a total of 1,737. Nonetheless, while inventory levels remain down, the new listings did help support sales growth.